The AK-47 is the most iconic and widely used assault rifle in the world. Here are some facts about this hugely influential weapon. The AK-47 was inspired by one of the most important German weapons of WWII, the StG44. The StG44 was the predecessor of modern assault rifles. It was the first widely used infantry weapon that could alternate between automatic fire and single shots. It gave soldiers the capacity to switch between devastating bursts of quick, close-range fire and more accurate long-distance shooting. Soviet forces came up against the StG44 late in the fighting on the Eastern Front. After being on the receiving end of its deadly effect, they wanted an equivalent of their own. The AK-47 was created by Mikhail Timofeyevich Kalashnikov, a weapons designer in his twenties. As a young recruit to the Red Army, Kalashnikov had irritated his company commander with his endless questions about military equipment. He was sent off to an armorers’ course. Then having been severely wounded in battle in 1941, he spent his recovery time designing weapons. It led to him working with the team developing a new sub-machinegun, including the then better-known designers Georgiy Shpagin and Georgiy Degtyarev. 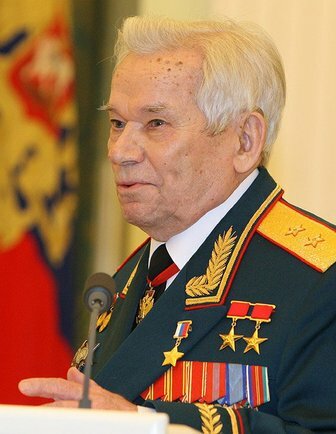 Kalashnikov was an energetic and original thinker. He adapted what he had learned as an armorer and worked with the other designers to create a series of the greatest small-arms in the world, including the AK-47. December 2009. Photo: By Kremlin.ru, CC BY 4.0. The AK-47 first appeared in 1946 and became standard issue for Soviet troops in 1949. Like the StG44 before it, the AK-47 used stamped sheet metal rather than castings to reduce production costs. Using it for components including the receiver made it cheap to produce. The cost was a vital factor for the Soviets, whose approach to war focused on quantity rather than quality. It also made it popular around the world, as relatively poor fighting forces could afford the weapon. Soviet doctrine emphasized rugged and durable equipment to withstand the hard knocks of military life. It was reflected in the AK-47, which is sturdy and straightforward, making it easy to maintain – another reason for its global popularity. 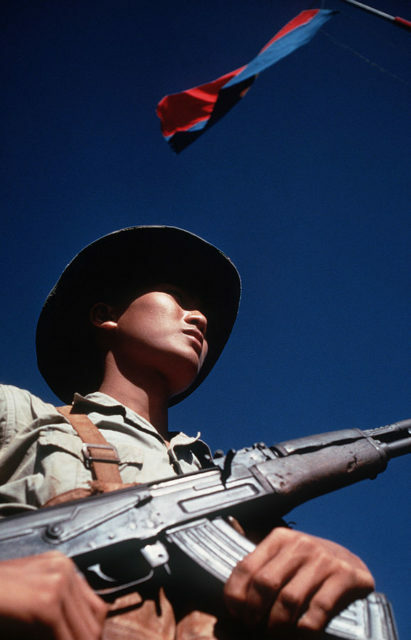 Viet Cong soldier stands beneath a Viet Cong flag carrying his AK-47 rifle. He was participating in the exchange of POWs by the Four Power Joint Military Commission. The AK-47’s reloading uses a long-stroke gas system, making it reliable in tough conditions. The downside of that is disruption to aiming and needing larger components than some other systems. The original AK-47 fired a 7.62 mm x 39 mm rimless cartridge. The bullet was introduced by the Soviets during WWII in response to the very effective bullets being used by other countries; particularly the German 7.92 mm short round. The 7.62 mm cartridge remained the standard Soviet military cartridge until the 1970s. It is still widely used and new guns are developed to use it. The AK-47 comes equipped with a 30-round curved box magazine as standard. Users have found various ways to get more bullets into the gun quickly, from adapting magazines to taping them together for quicker reloading. 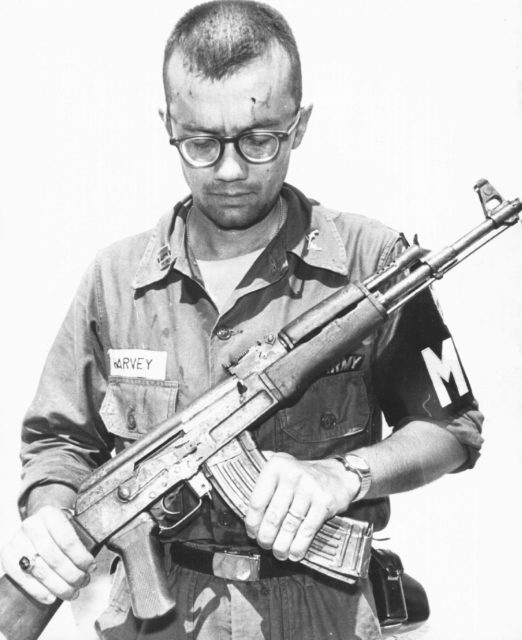 A U.S. Army M.P inspects a Chinese AK-47 recovered in Vietnam, 1968. The barrel of the AK-47 is chrome-lined with four rifling grooves. The muzzle is threaded, allowing devices such as muzzle breaks to be attached, adding to the weapon’s adaptability. The fire selector switch is an excellent example of a small detail that makes a weapon much more efficient. A large lever on the right side of the gun, the switch has three settings – safe, semi-automatic, and fully automatic. Rather than put them in order of fire-power, safe is at the top and semi-automatic at the bottom. That way, when soldiers are under pressure in combat, a quick, hard flick down on the switch will not set the gun to the ammunition-hungry automatic setting. The AK-47 and other guns derived from it proved so popular that millions were produced and sold around the world. By the end of the 20th century, an estimated 50 million such weapons had been manufactured. At the time of writing, the number has reached somewhere around 100 million, three-quarters of which are AK-47s. 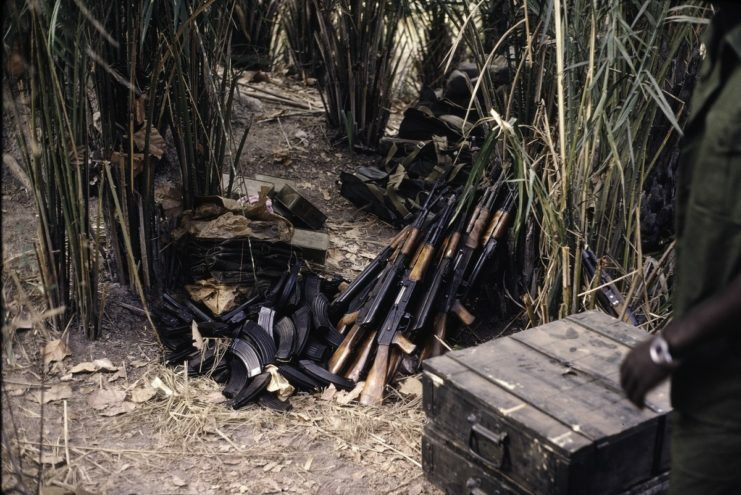 AK-47’s of the PAIGC-liberation movement, ready to be transported from Senegal to Guinea-Bissau, 1973. One of the AK-47’s main advantages was that it was relatively small and light for a weapon of its power. It was only 34.2 inches long and weighed 11.3 lb. 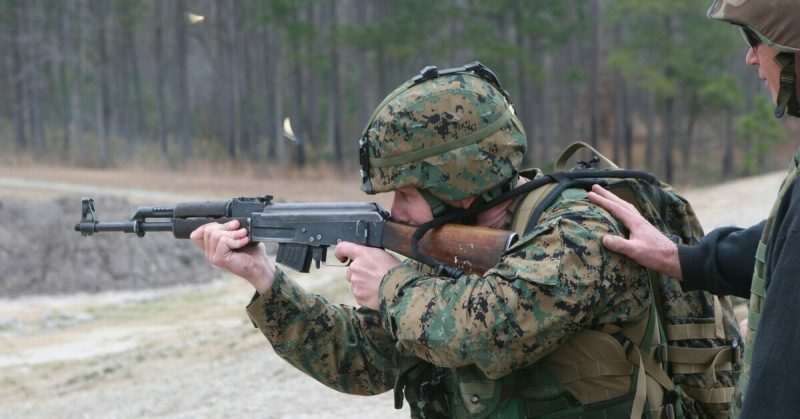 Although lighter automatic weapons have since been produced, it was on the forward edge of the technology in the 1940s and remains highly portable. With a mechanism firing at around 600 rounds per minute, the AK-47 is clearly capable of putting far more bullets into the air than it can carry. It is a rate of fire that could match the heavy machine-guns of WWI in a weapon a fraction of their weight. It allows the user to fire short, deadly bursts while on the move, a vital part of the skirmishing warfare that emerged from WWII. Many other weapons have been made by adapting the AK-47. Russian derivatives include the AKM and the AK-74. The AKM, introduced in 1959, used many of the same parts. It was further refined to use more stamped steel and a simpler locking system. It made it even easier to manufacture. It also reduced the weight by over a fifth, to 8.8 lb. The AK-74, introduced in the 1970s, was part of an international move toward smaller rounds. They enabled assault weapons to carry more ammunition for automatic fire, with the growing power of the weapons making up for the reduced impact of smaller bullets. The AK-74 used a 5.45 mm x 39 mm round which tumbled on hitting flesh, making for nasty wounds. It still had a 30-round chamber, which was shorter. Its rate of fire and muzzle velocity were both greater than the AK-47.